Home > Pro Audio Equipments > Amplifiers > Network Preamplifier > Rane NM-1 Network Mic Preamplifier/Power Amplifier - Free Shipping!!! Rane NM-1 Network Mic Preamplifier Power Amplifier - Free Shipping!!! The feature that adds the most versatility to the NM 1 is Power Over Ethernet (PoE). It is fully compliant with the IEEE 802.3af standard as a Powered Device (PD). This means it's powered through the CAT 5 cable that connects it to an Ethernet switch. Of course, the Ethernet switch used must comply with the 802.3af standard as Power Supply Equipment (PSE); these switches are available from all the major Ethernet equipment manufacturers. 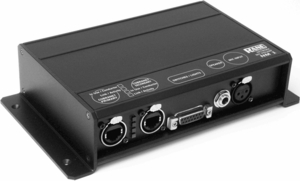 Rane's engineers have designed the NM 1 to have a redundant PoE supply along with the redundant data connections. It can be powered from either Ethernet port independent of which one carries the CobraNet data, so an independently redundant power system comes along with the redundant data system with no redundant effort. Switching between ports for PoE is almost seamless and audio interruption is minimal. If the primary port fails the secondary port takes over very quickly, typically 10 ms, without loss of programmed settings. All parameters are controllable via standard SNMP messages including microphone gain and muting, amplifier output level and muting, and CobraNet Audio channel and Bundle assignments. Four exterior switches assign the NM 1 MIB's SysName variable to uniquely identify each unit on the network.